Lahore : The 5th meeting of syndicate of Govt. College Women University Madina Town was held at University Committee Room which was presided over by Punjab Minister for Higher Education Begum Zakia Shahnawaz. The educational and administrative activities, financial matters, future education plans, increasing the financial resources and other relating matter came under discussion during the meeting. VC Prof. Dr. Noureen Aziz Qureshi gave presentations about the performance, education matters, available facilities, new initiatives and issues of GC Women University. The syndicate meeting was attended by the members including MPAs Madiha Rana and Begum Suraiya Nasim, VC Women University Multan Dr. Shahida Hussain, VC Fatima Jinnah University Rawalpindi Prof. Dr. Samina Amin Qadir, Acting VC Pakistan Institute of Fashion & Textile Designing Lahore Prof. Hina Tayyaba, Prof. Tariq Aziz, Afsar Sajid, Higher Commission and Finance Department Punjab representatives Barik Ullah, Aamir Saeed and others. 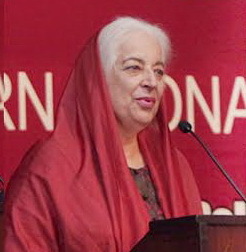 The Minister for Higher Education Begum Zakia Shahnawaz expressed her satisfaction over the performance and new initiatives of the GC Women University. She said that Punjab govt. was utilizing all out resources for providing facilities of higher education to the students and funds of Rs. 46.86 billion had been allocated in the current financial year budget for the higher education sector. She said that additional buildings and necessary equipments would be provided to the Universities established in Sialkot, Bahawalpur, Rahimyar Khan, Faisalabad and Multan. She informed that a women University and IT & Engineering University would also be established in Sialkot by the Punjab govt. The Minister maintained that laptops would be distributed among the 4 lacs talented students in this year with a cost Rs. 4 billion. She said that girl students were being provided equal opportunity of the higher education to bring them main stream of the development. She emphasized upon to gear up the efforts for the establishment of GC Women University Faisalabad new Campus and directed that the planning should be devised for the rehabilitation of girl hostel. She assured that the required resources would be provided to the University for the development and uplift of the various faculties and other infrastructure. VC Prof. Dr. Noureen Aziz Qureshi informed the Minister about the GC Women University history and said 9762 girl students were studying in this university at present including 2968 intermediate, 5768 BS programmes, 706 Post graduation, 301 MPhil and 19 PHD students. She informed that 396 acre land had been earmarked at Jaranwala road near Bypass for the establishment of new Campus of the University. VC said that the university had signed various MOUs with local, national and international institutions for exchanging experience and university uplift. She gave the details of facilities available in the university other than education facilities including library, water filtration plant, transport, banks, dispensary, canteen, day care centre, bus launch waiting areas and others. The members of syndicate gave different proposals for the development of the university and promotion the faculties inline with the most advanced technology. In the beginning of the meeting, the fateha was offered for the departed soul of MPA Kaneez Ishaq and renowned social leader Abdul Sattar Eidhi.